Centre Rézodanse – Egypte, in partnership with Brouhaha International (UK), organise the first Street Parade in Alexandria. 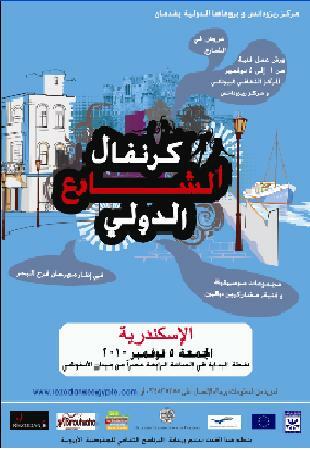 The event will take place Friday 5th November 2010 between 4pm and 6pm in front of Qayt Bey Citadel. The Parade is organised in the framework of the Farah El Bahr Festival, which is organised by the Anna Lindh Foundation, and will take place on 4th and 5th November within the Qayt Bey Citadel. In the framework of this event, a series of workshops held by international artists coming from Poland, the Netherlands, the UK, and Italy, will take place between 1st and 4th November, in Hip Hop, Clowning, Street Theatre and Samba (Brasilian drums). The workshops are organised with the support of partner schools (Institution Ste Jeanne Antide, St Charles German School, Schutz American School and Ecole Molière) and the Greek Cultural Centre. They are open to teenagers and adults, and will take place at Centre Rézodanse – Egypte and at the Greek Cultural Centre. Some of them will also take place at Ste Jeanne Antide School. 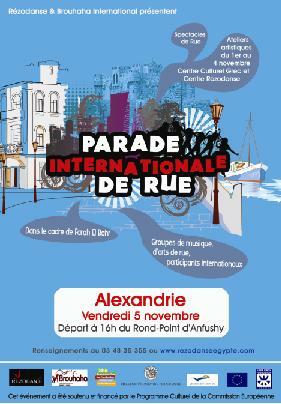 More than 300 participants are expected to take part in the first Alexandrian International Street Parade. Besides the international artists and those who took part in the series of workshops, the Parade will count one brass band, two Nubian musical bands as well as a Clown group. This long défilé will circle around the pedestrian area in front of the Citadel, for two hours, bringing a joyful, colourful atmosphere to this landmark of Alexandria. The Parade will end with a set of informal presentations done by Hip Hop dancers, clowns, and a group of characters inspired by the Comedia Dell’Arte. Brouhaha International has been organising the Street Parade in Liverpool (UK) for almost twenty years. The Alexandrian Parade is directly inspired by the event taking place in the UK each summer. Centre Rézodanse – Egypte is the local organiser of the event, in partnership with other local cultural bodies such as the Anna Lindh Foundation, the Greek Cultural Centre in Alexandria, and local schools. The Parade and the workshops are supported and funded by the Cultural Program of the European Commission.